Dungeons and Dragons is a collaborative experience. What many players don’t realize is that the collaboration begins before you even sit down at the table for the first time. I’m talking about your character’s backstory. The backstory is the way you interact with the game world before you even roll your first die. It decides your character’s place before you even sit down at the table. Here are some tips, from a long time player and DM, on how to make the best of your backstory. Give your DM something. The best backstories I’ve had players give me gave me nice juicy hooks I could use later in the game. They give me enemies and NPCs to bring out when I want to add some personal depth to the story. Don’t get too complicated. While it is good to give your DM some nice things to use, it’s not good to make a thousand year history leading up to this very moment. It’s not a bad idea to have an idea of these things, but, you don’t need to have the complete unabridged life and times of every member of your clan. That’s too much. Don’t be afraid of relationships between PCs. I remember when I was playing a campaign with two of my best friends, who are now engaged; she and I decided that our elven characters would be engaged. They were in an arranged marriage. It added a whole new dimension to the party dynamic. Those party relationships don’t have to be sunny and great. In literature, there’s always the classic tale of enemies, forced to work together for a common goal. Think of how fulfilling this could be at your table. The most important thing to remember with your backstory is that you don’t have to do it on your own. Remember, a great backstory can lead to a great campaign. I have to start this post this way, so bear with me. If any of my players are reading this (and I know you guys do) there will be spoilers. I repeat, spoiler alert. Okay, on to the post. When I was in college, I had this joke where when I butchered English and someone called me out on it, because I was an English Major, I’d tell them I’d earned the right because I had a ‘poetic license’. I almost showed a gullible few the card. For those not familiar with the concept, poetic license is the changing or tweaking of the rules of grammar in order to improve a piece artistically. I’ve applied this concept to Dungeons and Dragons to great success. As a DM, I love breaking conventions. I love presenting well known monsters and situations to my players in ways they’d never expect. Altered powers and abilities, races living in a completely different way from any other setting, new looks, these are the sorts of things I do. One thing I’ve always liked about Eberron as a setting is the unorthodox approach it takes to the well known races. Some are the same, dwarves are mountainfolk for example, while others are very different, elves live in the jungle and have temples where they worship they’re honored dead. I think the best example of this (and one of my favorite races) is the drow. In most settings, drow are elves, corrupted by dark forces, living in vast underground cities with a brutal slave based lifestyle. In Eberron, drow are elves corrupted hundreds of years ago by the rampant magics of the giants. They live in a brutal, tribal society that worships spirits. While I like this idea, I decided against it. I knew that the players who knew the setting well would be expecting drow and decided to change things. The drow in my Eberron are raiders, using massive airships to gather loot and slaves. Few have ever seen them. There are elven legends and folklore about the ‘black storms’ but the players know nothing about the cause or consequences. The reason for this is because the drow airships, known as ‘storm arks’ are surround by arcane storms of darkness. I told this plan to someone outside of my campaign and he looked at me for a bit and then said ‘that doesn’t work. Drow don’t do that.’ He then couldn’t come up with a coherent reason why drow shouldn’t be storm controlling air raiders. Then I knew that I’d done exactly what I wanted to. I used my poetic license to change a race and I can’t wait to see how it turns out. Sometimes I’m not very confident or high on my own DMing skill. This week, when my players and I returned to our regular game, I did not feel like that. When last we left, they’d been defeated, their characters were on death’s door, and it looked as if the Sons of Liberty’s attack on the city was going to happen as planned. And then I let it all happen. The attack, the character deaths, all of it. Step back a few months to when they were tpk’ed for the third time. We made a group decision that that was it, they’d already come back from total defeat twice, there was no way it could happen three times, so I told them to roll new characters. This is usually the death knell of any campaign, but I wasn’t going to let that happen. 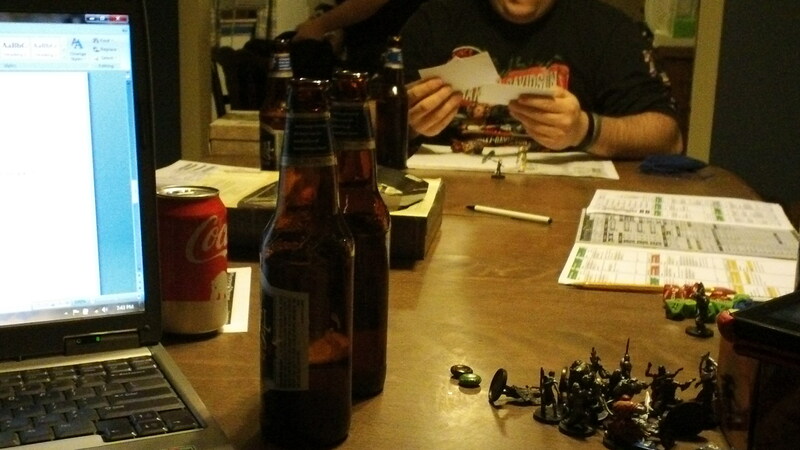 Three of them rolled new characters (Paul’s character survived, albeit hideously mangled). Jeremy’s is his old character reborn as a revenant and Rob and Paul are playing characters that are tied closer to the story than their originals. But it was still a very different party. I knew how I transitioned from the old party to the new one was going to make or break the credibility of this game. I nailed it. If anything, they like the new direction better. I wrote them a prologue so they could play through their characters deaths and I don’t mean in combat, I mean actually roleplay the deaths of their old characters. This allowed me to show them the destruction of Sharn (an event that will have far reaching consequences, it’s pretty much going to drive the campaign from this point on) and build up a reoccurring villain for later use. The villain is their old friend Black Claw, though it’s more accurate to call him “Black Claw” at this point. He abducted one of the old characters promising that he would ‘become me’. I have to admit that I’m actually not sure where this is going quite yet, but I’m excited to see how it evolves. What happened next was I put the blame for the destruction of Sharn on one of the characters (there had been records of them knowing about the attack and they were below the city when it happened), Paul’s, the only one to survive. He was sentenced to life in Dreadhold, the Alcatraz of Eberron, and this was where the other characters came in. I placed them all on a train headed for Dreadhold all with their own interests in whether the train makes it or not. However, the characters weren’t the only ones who had an interest in Paul’s character making it to Dreadhold. I changed things one last time. The train was boarded and destroyed by Merrix d’Cannith. He then asked the players to go to Xen’drik and participate in very illegal activities on his behalf. One of the new characters, Andy’s Alexi d’Deneith, is on the opposite side of the law from that. To handle this, I had the Deneith baron order Andy to help Merrix until he had enough evidence to bring Merrix down. And that’s how I gave the party a new patron. At the end of the night, I had successfully revived a campaign and given my players an adventure they couldn’t wait to play again. Not bad if I do say so myself. Next week I’ll talk about surprising your players by presenting old things in new and unexpected ways. As a DM you have an arsenal of weapons to attack any of the problems that come up during your game. But, what most DMs don’t realize is that the greatest weapon they have is one simple word: no. That’s not to say you should tell your players no all the time and turn you game into an exercise in tyranny. It’s just I’ve noticed many DMs who are too willing to let their players get away with anything they want. Too many players these days feel like they’re being ‘railroaded’ because they always get to run into the tavern, completely away from the adventure and kill everyone. They feel like the story isn’t about their characters because they aren’t the center of every NPCs attention at all times. They feel it isn’t fair when their character gets bloodied. Why could this be? I guess a lot of DMs are just afraid of telling their players who’s in charge at the table. The ongoing campaign isn’t just your story, never forget that. At the table you’re creating a narrative together. And anything that disrupts that narrative is anathema to what you’re trying to accomplish. I’m not saying you have to force the players into the castle when they want to go the forest, but if they want to moon the king and act stupid to the townsfolk, that’s unacceptable (and you might want to rethink members of your group). When that player says ‘I drop my pants’ you tell him no, you don’t. With that one word, you remind the players who is in charge, you remind them of the tone of your game, and you do it all without having to get snotty or hurt feelings. But, this must be used responsibly. A player wants to pick a game breaking option he found in the bowels of the internet? Say no. A player wants to start killing party members because ‘that’s what his character would do’, you tell them no. But if a player wants to do something interesting, something that won’t ruin the game for everyone else, you let it happen. The best times in this game come from the unexpected. Remember, you’re all in this together. It’s not about you; it’s about everyone at the table.